When debriefing after a difficult communication encounter led by a fellow or resident, I’ll often start by asking the trainee, “how do you think it went?” There are times when I thought the encounter went very well, yet the trainee leaves the room with a worried look. Perhaps the trainee clearly explained the medical facts, demonstrated ample empathy, and carefully talked about the next steps, so I’ll be a bit surprised when the trainee says, “It went horrible.” I’ll ask why, and I’ll get a bemused look in response. “Because I made the patient cry,” the trainee might say. Usually, when this happens, the trainee knows that it was the serious news that made the patient cry: A change in condition, a revelation about prognosis, etc. Deliberate reflection on skillful communication requires some understanding that while patients may respond differently to various communication techniques, we are ultimately not responsible for the patient’s emotional response to serious information. Even if giving the information was the ethical and pragmatic way to proceed, the physician is at risk for experiencing strong emotions that mirror those of the patient’s. The response of the patient and the physician’s experience of observing the response might make some second guess whether they have approached the conversation skillfully, even when they have. 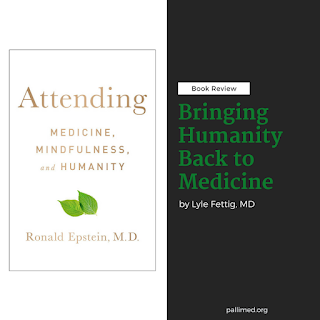 “Attending: Medicine, Mindfulness, and Humanity” by Dr. Ronald Epstein, professor of family medicine and palliative care at the University of Rochester, is all about how physicians cognitively and emotionally process not only moments like this one, but also the more routine moment to moment emotional roller coaster of the practice of medicine. It’s a practice that is rich with cognitive complexity but always mingling with emotional intensity: Anxiety over making correct diagnoses or missing something. Frustration about electronic medical record systems. Helplessness when faced with symptoms we cannot explain, or sometimes cannot alleviate adequately. We all experience these thoughts and emotions in our own way, and all develop methods (sometimes adaptive, sometimes not so adaptive) to respond to our inner experience. Dr. Epstein blends a mix of his own experience (which he describes with vulnerable humility), the experience of colleagues, and a description of some of his own research (example here) as well as related research in neuroscience, decision-science, and resiliency. The result is a readable, thought-provoking, useful, and comforting book that I’d recommend to any physician, or for that matter, any health care professional. 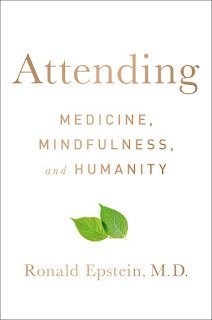 The book starts with a chapter on mindfulness in the practice of medicine and then a chapter on the related concept of “Attending” which describes our human ability to attend to a limited number of stimuli at once, leading to inattentional blindness (which none of us are immune to), and why this contributes to the challenges of medical diagnosis and management as well as why it may be so hard for us to recognize the experience of the patient at times. Even for people who are highly empathic, there’s still a risk of losing sight of the other person’s perspective when you’re lost in clinical reasoning, etc. He then further expands the discussion to the topic of uncertainty, and how we in medicine are certainty junkies, which brings with it a risk for crowding out curiosity. And that has negative implications. Palliative care clinicians will especially appreciate his reflections on the concept of “presence” or “bonded resonance” in which two people are in touch and in tune with each other. Quoting philosopher Ralph Harper, he talks about the important role of presence in “boundary situations,” times of vulnerability and uncertainty. Philosophers and scientists alike have explored this resonance, and he describes two seemingly competing, but perhaps complementary, theories for how this happens. The first is “theory of mind,” where it’s thought that we theorize what might be going on in other’s minds, and might occasionally verify in communication if we understand their thoughts and feelings. The other theory is “embodied simulation” which posits that we “relive in our own bodies and minds the actions and presumed intentions of the other. He states that the current body of research comes to an intuitive conclusion: our cognitive and emotional lives are shared psychologically and neurobiologically, and boundaries between those sharing in presence are blurred. This is a wonderment, and it reframes the feeling of dread that often goes along with breaking bad news. Yes, it's the information that makes the patient cry. It's information that the physician shares from his or her own mind to the patient's, who reciprocates with sharing emotion back to the physician. Although the physician has not "caused" the bad news, perhaps the feeling of responsibility for the patient's emotions stems from the blurring of boundaries? I eagerly read the chapters on “Responding to Suffering” and “The Shaky State of Compassion” and agree with his supposition that while training in empathy is important, it only goes so far and there’s a real risk of emotional contagion- taking on the patient’s distress. Describing research about compassion, he describes “exquisite empathy” or compassionate action that may relieve the patient’s suffering and in concert, release the emotional tension that the clinician experiences. (I would include plans that come about after careful goals of care discussions as "compassionate actions", and even the process itself, that involves a lot of sitting with patients and grappling.) The good news is that there is growing data that compassion can be cultivated through practices such as loving-kindness meditation. The book closes with chapters on resiliency in both the individual clinician and in the healthcare system with compassionate suggestions for his colleagues that don’t aim to “fix” the problems of our broken healthcare system, but do aim to help us build capacity to respond to it. Everything he writes about complements, integrates with, and bolsters important communication skills commonly taught by palliative care clinicians. You’ll have to read the book to see some of his suggestions, but I’ll leave this review on a personal note. I personally am not immune to burnout and anxiety, as well as occasional dysthymia and rarely, depression. I remember when I was just starting, our team’s chaplain asked me to notice my breathing in the middle of a visit with a very anxious man who was in pain as well. To my surprise, I was holding my breath, perhaps an embodied simulation of what I witnessed. I think of the multitude of simulations we process each day, with patients, their families…and with colleagues, and this is a timely book for our field and for medicine in general. I think this book offers a framework to consider how we might become more resilient, yet I recognize that someone out there might be reading this right now in the midst of a personal crisis. If that's the case, I could imagine that hope might not come as easily as you would want. So, I have one last heartfelt note for everyone, but especially for my physician colleagues. It comes from the experience in the past couple of years of losing a physician colleague to suicide. Recent research indicates that burnout in HPM physicians is something we should pay attention to carefully. It's an issue in medicine more broadly. Physicians have higher rates of burnout, depressive symptoms, and suicide risk than the general population. An estimated 300–400 physicians die by suicide in the U.S. per year. Don't wait until a crisis point, it's ok to think of it as a quality of life issue! Seek help if you are suffering. You may feel shame, but that's part of having depression and not because of who you are. There are likely resources available to you locally at your own institution or in your community. If you are in crisis, you can also call the National Suicide Prevention Lifeline at 1-800-273-8255. There is no shame at all in reaching out- we need you in this world. Dr. Lyle Fettig is an Assistant Professor of Clinical Medicine in the Department of Medicine/Division of General Internal Medicine and Geriatrics. Dr. Fettig directs the IUSM Palliative Medicine Fellowship and works clinically with the Eskenazi Health Palliative Care Program.